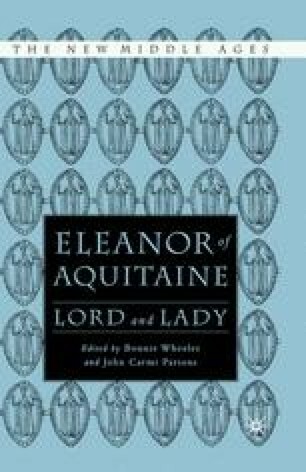 Jacqueline Murray’s lovely video introduction to a study of medieval women describes the subject of this volume as “the remarkable Eleanor of Aquitaine, wife of two kings and mother of two kings, and a powerful ruler in her own right.”1 But Eleanor was also the mother of two queens and grandmother of many more. Through her daughters and their female descendants, Eleanor had lasting influence—cultural and political as well as genetic—over a wider Europe than the empire built by her second husband, Henry II of England, and lost by their youngest son, King John. Historians of the Middle Ages have traditionally reproduced genealogies by following male lineages across generations, often missing interesting relationships among powerful women. As the first taste of a potentially rich feast, we reconstruct here the lives of Eleanor’s granddaughters on the female side (that is, the daughters of her daughters).